Wyoming is a spectacularly beautiful state filled to the brim with eye-catching splendor. See some of the images I captured here. Yellowstone National Park in Wyoming is filled to the brim with gorgeous and unusual beauty and this article will represent two days worth of my photographs taken while there on vacation. In the summer of 1988 we spent an entire two weeks at Spring Creek Ranch in Jackson Hole, Wyoming, making that our base camp. 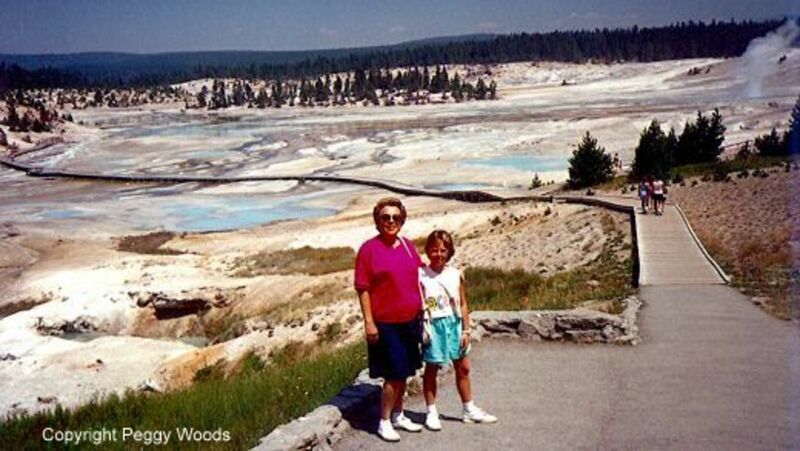 My mother, niece and I spent most of the time exploring The Tetons but decided that we also wanted to see some of Yellowstone National Park. We took a guided bus tour of the lower part of Yellowstone one day and drove up to see more of it on another day. Yellowstone encompasses 2.2 million acres and is the largest of our National Parks. Parts of it are in the States of Wyoming, Montana and Idaho. One can travel over 350 miles of paved roads. There are two main loop roads almost making a figure 8 and this first day we spent time sightseeing in the lower part of the loop. It made for an 11 hour day! 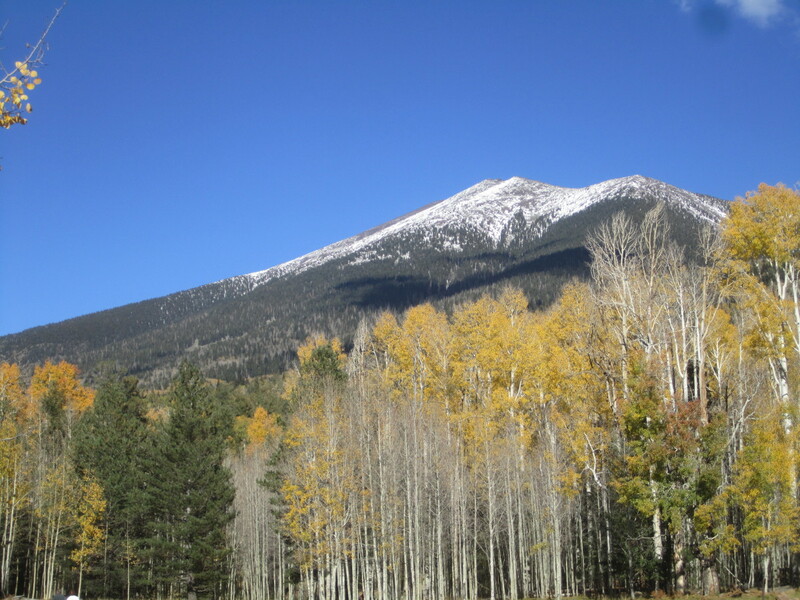 Many of the roads are at elevations of 7,000 to 8,000 feet, however the true range of elevations vary from around 5,300 feet to almost 12,000 feet. 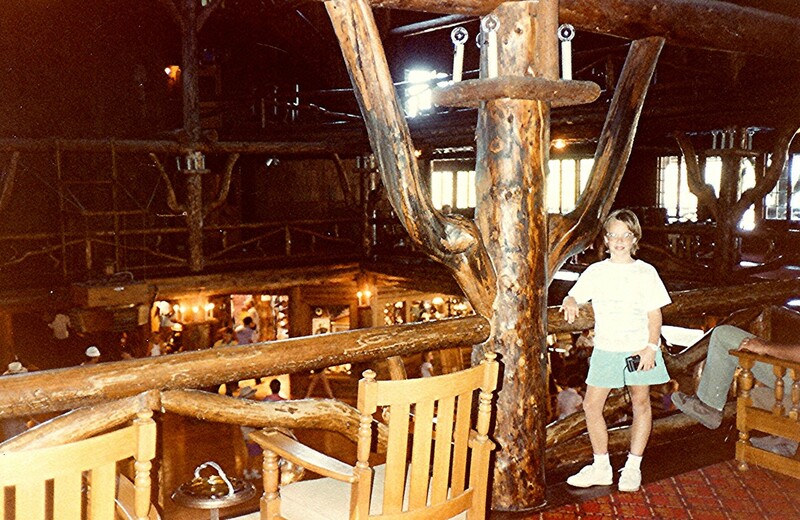 Our first stop was at the Old Faithful Inn. This is the second building on this same site. The first burned to the ground in 1894. 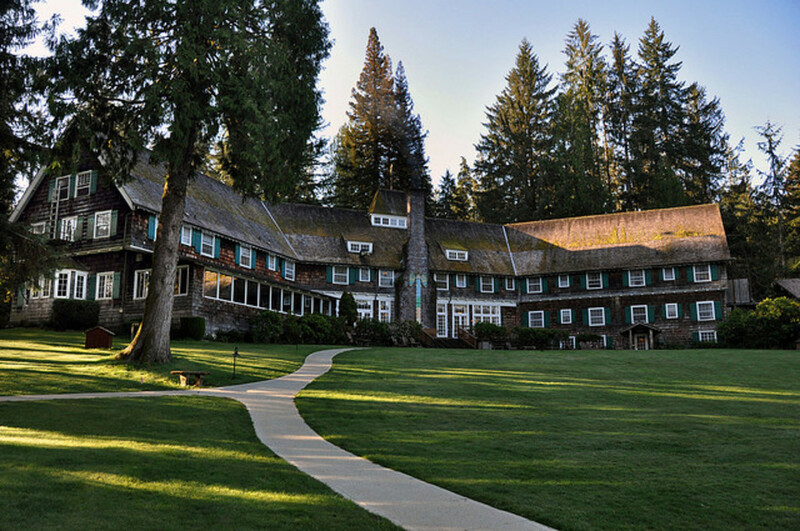 The architect Robert C. Reamer designed this building in 1902 and he wanted native materials utilized in the construction. 500 tons of rocks were brought in from a nearby hill for creation of the massive fireplace. The immense logs came from this same environment and hand-wrought hardware was designed by a blacksmith on site. Mr. Reamer used dormer windows which added some light to the soaring 85 foot high ceiling in the central lobby. They add a distinctive look to the building and Mr. Reamer used them often in buildings he designed later in his career. 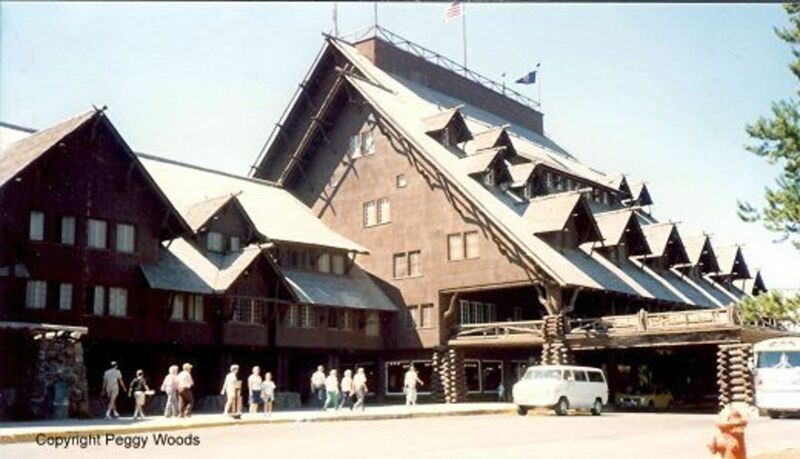 Old Faithful Inn, completed in 1904 originally had 140 rooms. 230 additional rooms were added upon the completion of two wings to the hotel. 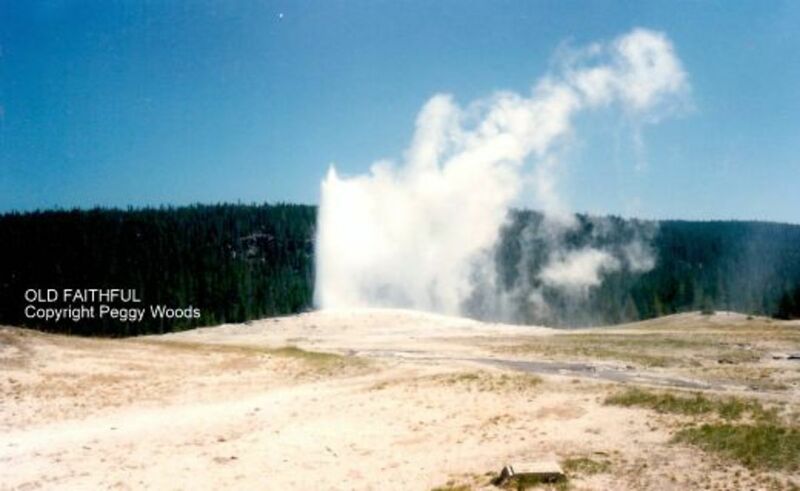 The geyser "Old Faithful" is located nearby and puts on it's regular show for visitors from near and far. 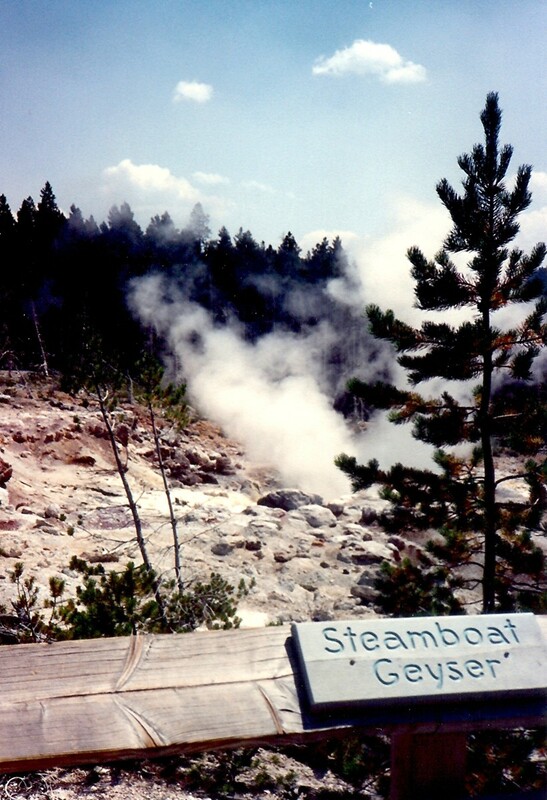 It is a cone geyser and erupts sending it's white plume of super heated steam and water about 145 feet into the air. This spectacular show lasts from 1 1/2 to 5 minutes on average and it does this every 65 to 90 minutes. As our tour bus moved on, we saw many buffalo grazing alongside rivers and in pastures. Mule deer who grow quite large in this area and moose with their calves were also spotted. The bus stopped at Gibbon Falls so that we could get a closer look and take some photos. It is in a lush and green part of the park. 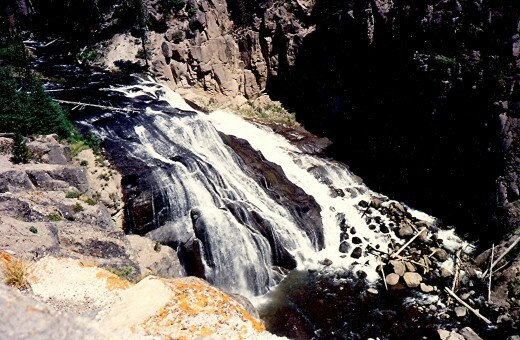 A major tourist destination within Yellowstone National Park is the Lower Falls. We were told that it is three times the height of Niagara Falls. It tumbles 308 feet down and is a beautiful sight to behold. 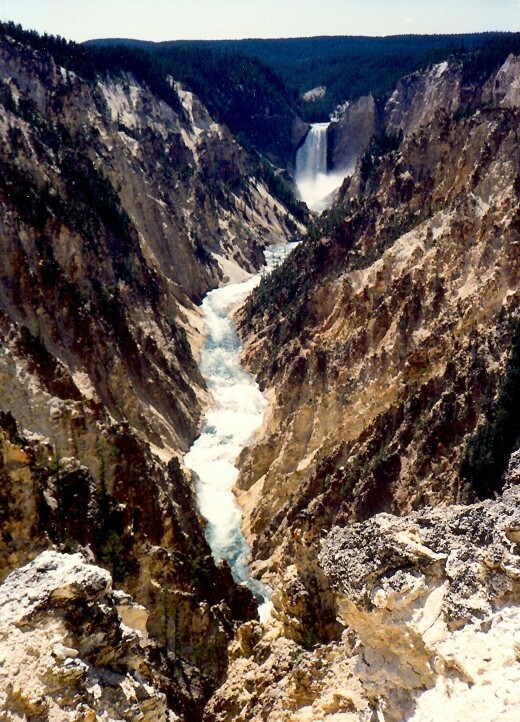 The Grand Canyon of the Yellowstone weaves its way through the park and offers shelter for an abundance of wildlife. 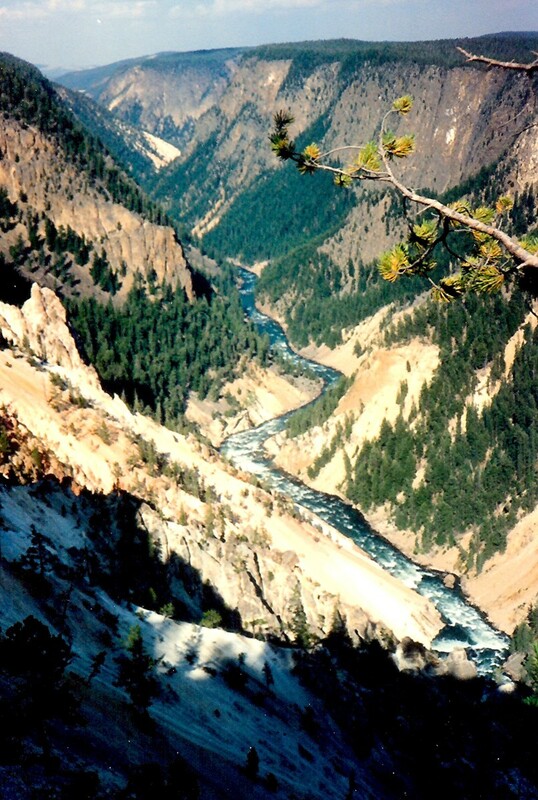 This is a mountainous region and the beauty of the Yellowstone River below as it twists and turns through the canyon is something to behold. After leaving that gorgeous area our bus driver took us through the lush Hayden Valley following alongside the meandering Yellowstone River. Our last views of this day included looking at Yellowstone Lake. It is North America's largest mountain lake with 110 miles of shoreline. At it's high elevation it is ice capped much of the year. The white cloud-like appearance above the blue water of the lake is smoke! Numerous fires were raging in the year we visited the park and some areas were not available to tourists due to firefighting efforts to contain the blazes. This ended our first day of exploration and after we were driven back to Jackson Hole we were exhilarated by what we had seen of this park and determined to see more of it on another day. 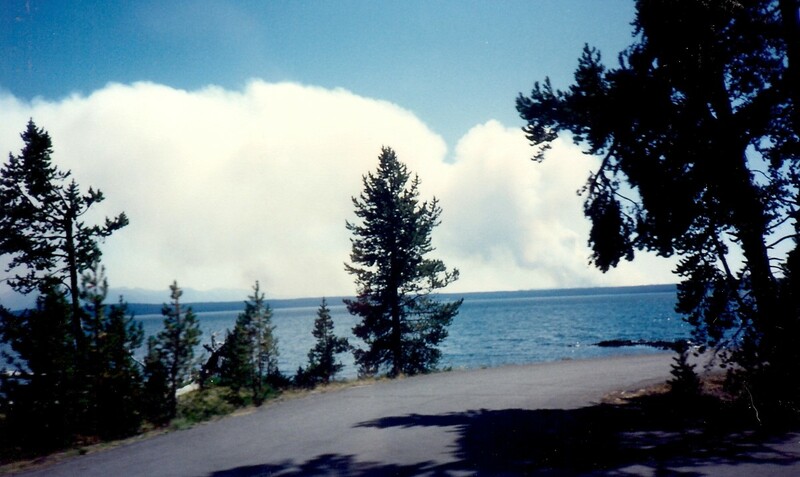 Because of all the raging fires in Yellowstone the southern entrance was closed. We had spent several days exploring the Tetons and decided that it was time to see more of Yellowstone. 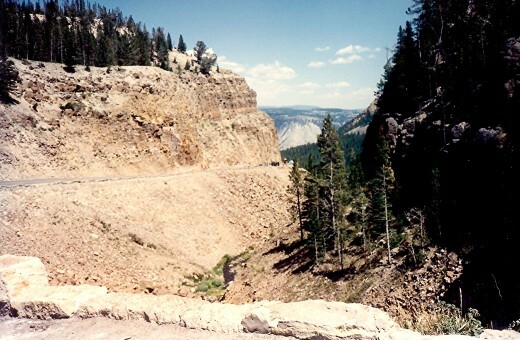 Driving through Idaho and entering Yellowstone from the western entrance to see the upper loop of the figure 8 paved road through the park became our access route. Many sights still awaited us! Traveling through that portion of Idaho was interesting to say the least. I think that most people think of Idaho and relate that thought to Idaho potatoes and we surely saw the potatoes being grown! We saw innumerable rolling hills with massive irrigation overhead sprinkler systems in place. What was not evident was the appearance of people. We drove for miles and miles before we would eventually see farmhouses or barns. And those were few and sparsely spaced at least on the road that we were traveling. Mostly just green planted hills of vegetation were seen. Interestingly we viewed 6 or 7 earth and grass covered sheds near silo's. It was a strange feeling to be driving so many miles and not not see a living soul alongside the road. The farms along the road were so few, but the ones we did see had multiple silos that were obviously used for storing their crops. We did not even see many other cars on the road! Had we had a flat tire we might have had a long wait until anyone had discovered our problem. Fortunately that did not happen! At last we entered Yellowstone National Park from the western entrance. This next area that we visited was beautiful and at the same time unlike most areas of our planet earth. 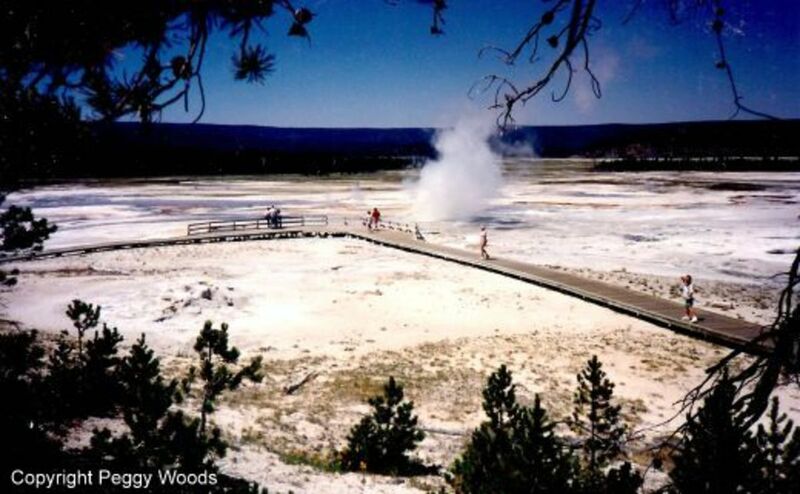 Porcelain Basin in the Norris Geyser Basin rests over a major fault in the earth's crust. It is one of the most volatile and hottest exposed areas on earth. 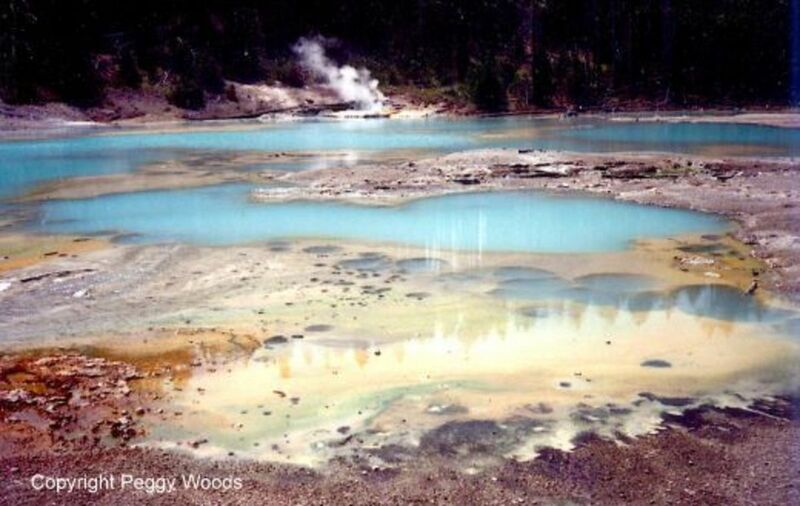 Runoff channels from geysers and hot springs are colored by minerals, bacteria and algae. The color of algae is related to water temperatures with the light colored algae existing in the hotter water. Algae seldom exists in water over 160 degrees Fahrenheit. This area is constantly changing due to minor earthquakes in the region. Some areas that are hot and lifeless gradually change.........cool...........and vegetation starts growing again. The reverse is also true. My mother felt very uneasy in this locale and was happy when we left it to view other areas. I must admit that it is certainly a different feeling being in this thin crusted area of our planet earth with so much variance of volatility. One is warned to stay on the raised paths because one could literally punch holes in the ground and sink who knows how far down if one were to walk where these wooden pathways are not provided. We stopped to see Steamboat geyser which was spewing some steam. It is the world's largest geyser but erupts at intervals of days to years. Obviously we did not stick around to see the eruption. 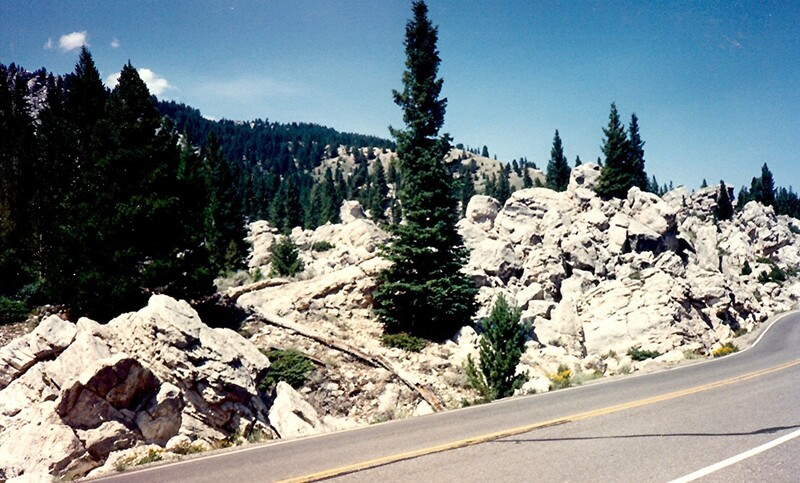 Continuing north of Norris we drove through some beautiful mountain scenery at elevations of 7,000 to 8,000+ feet. 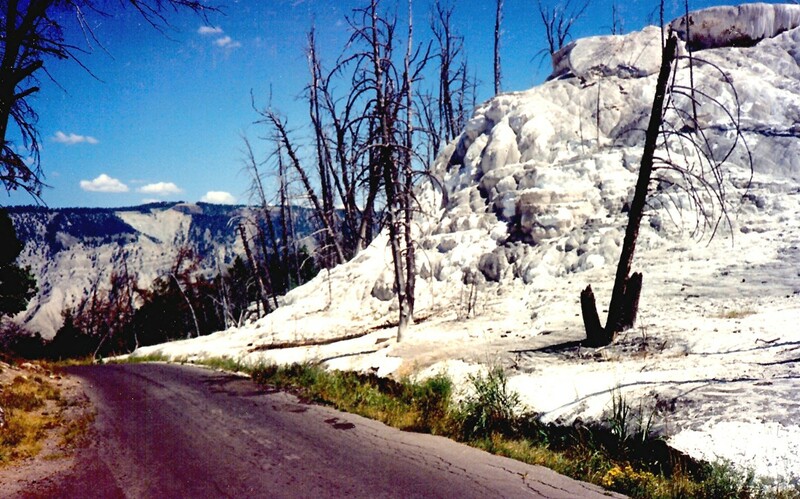 Just south of Mammoth Hot Springs is the Upper Terrace Loop Drive. 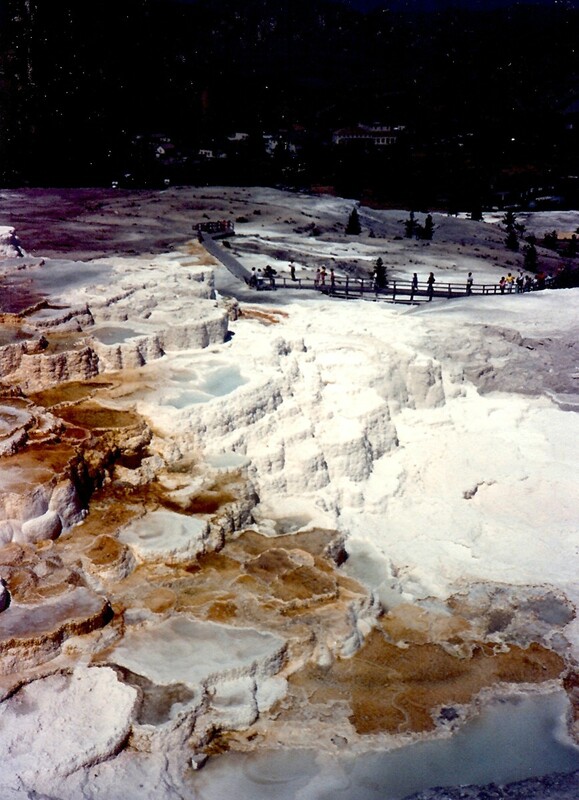 It is another thermal area with predominately white rock. 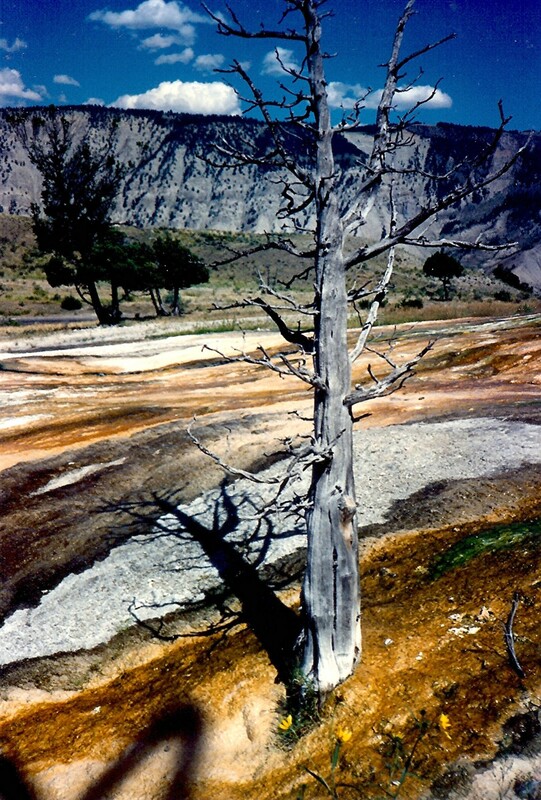 "Gnarled limber pine trees on some extinct formations are now over 500 years old." Terraces viewed at Mammoth Hot Springs are made up of travertine (calcium carbonate) deposits that are continually being laid down to form these spectacular shapes and formations. This would be an ever changing landscape. 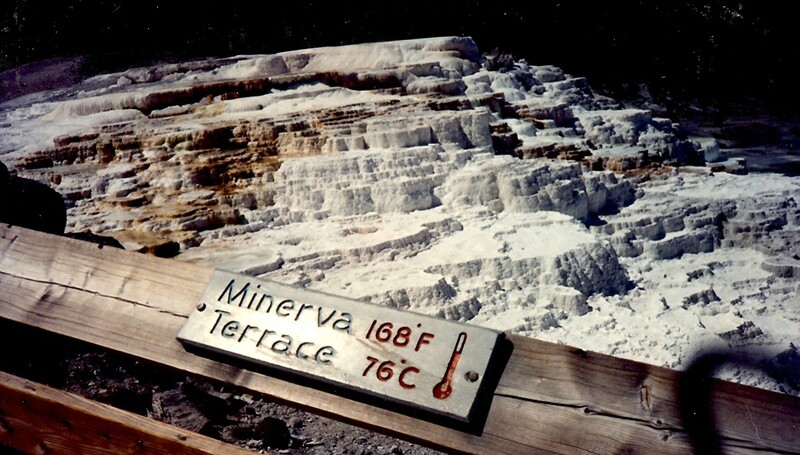 Minerva Terrace is the highlight of this area. An interesting aspect affecting this area was the effects of glaciers moving through this part of the country in past eras. They scoured some parts of the country and left interesting remains of their passing in other areas. 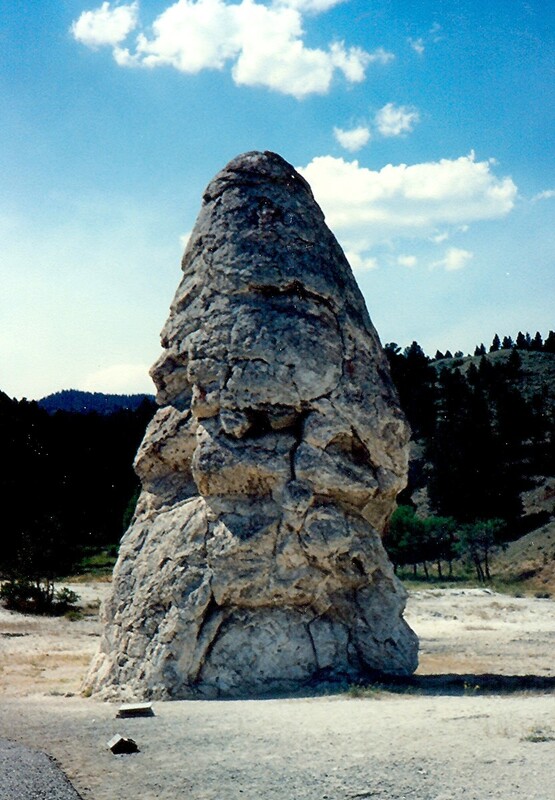 One such monolithic remains is called the Liberty Cap. 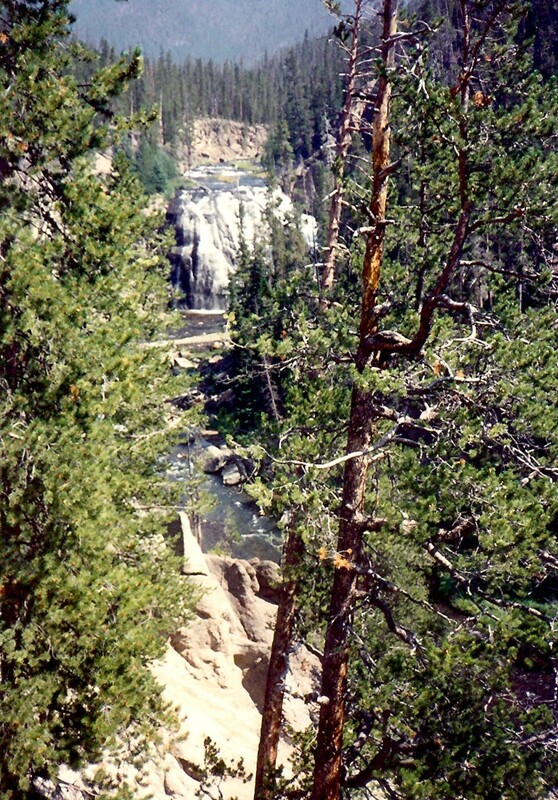 The road east from Mammoth Hot Springs leads one in a matter of 4 miles to Undine Falls. It is pretty country with vistas of far off mountains; meadows. blooming wildflowers and open space. Lava Creek Picnic Area provided a great spot for a late lunch. After our respite we took a small detour and saw a large still upright petrified redwood tree. Next we traversed the road to Tower Falls. It tumbles 132 feet into the Yellowstone River and is at an elevation of 6,650 feet. 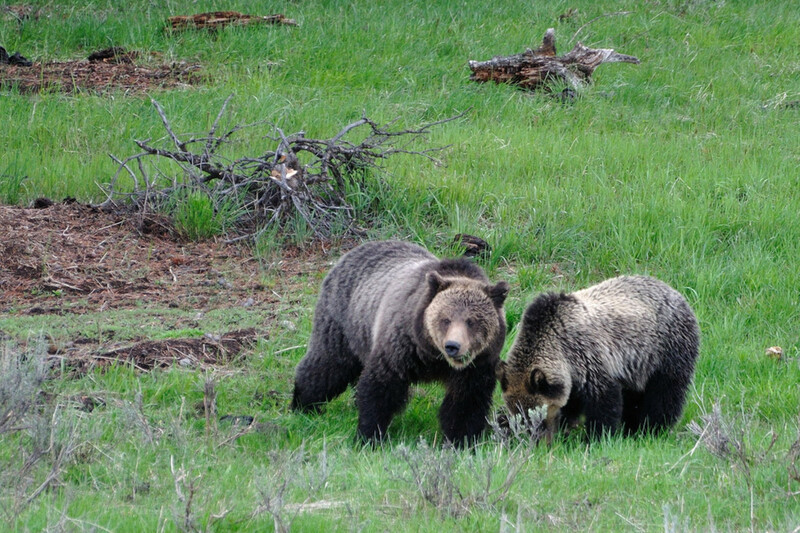 The area near Tower Falls is closed to human traffic as it is prime grizzly bear country. Our next stop was the magnificent Grand Canyon of the Yellowstone. 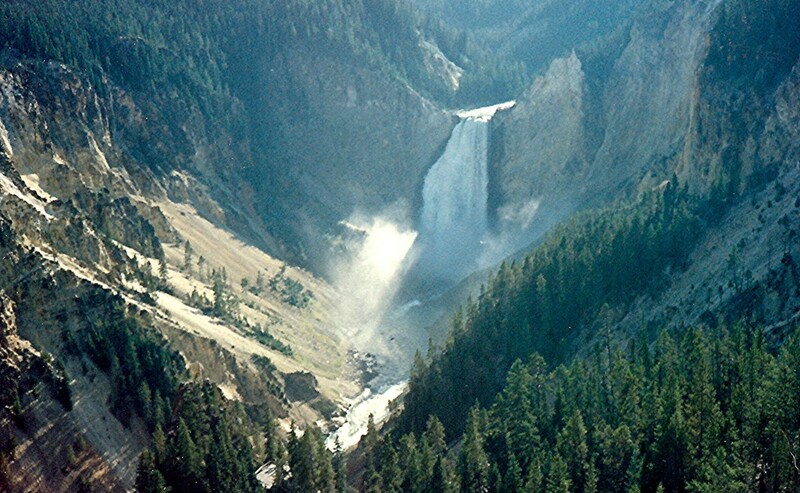 We had already seen this from the Lower Falls perspective and now we were able to view it from the Upper Falls area. Leaving this area we saw more evidence of glacier activity and my niece posed by a huge boulder left behind when that action occurred in past centuries. On the way back to the west entrance of Yellowstone we saw more buffalo and a huge herd of mule deer. My niece counted 66 of them! Trumpeter swans were also seen. They number only about 1500 in the entire world. 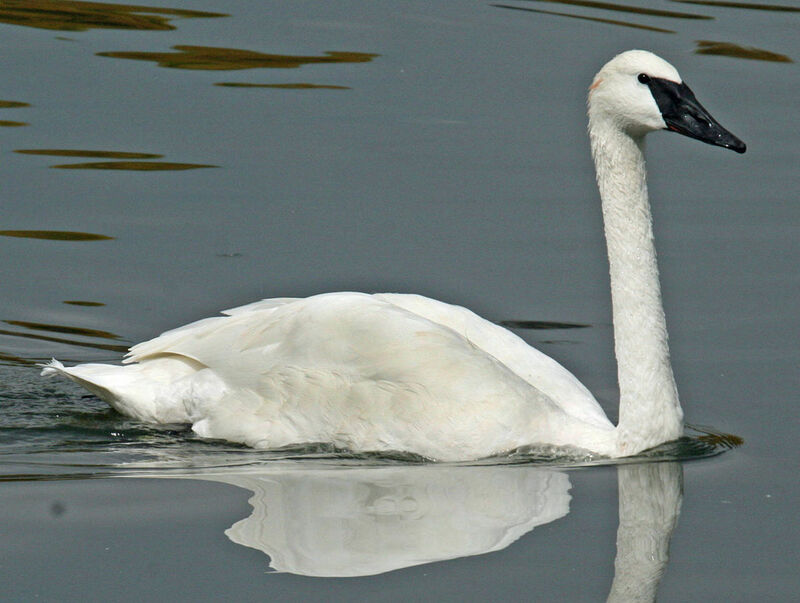 They are the largest waterfowl with a wingspan of approximately nine feet. A pair of them with their young were also seen by us in the National Elk Refuge just outside Jackson Hole. It was nice to think that this species seems to be thriving in our protected national park system. Driving in darkness through the Tetons Mountains and coming around a bend in the road we were startled to see a huge orange ball appearing in the road ahead of us. It turned out to be the moon! We had never seen it look so large and so close to us at any other time or place. It was gorgeous suspended in the sky over the town lights of Jackson Hole as we descended the mountain road into town. As we drove up to Spring Creek Ranch on the butte overlooking the town we spotted a large jackrabbit in the road. Arriving home after a 15 1/2 hour day of sightseeing we were definitely tired but also enriched by the sights that we had just seen. Obviously one could spend much more time in this largest of National Parks in the United States, but we at least had a good flavor of what it had to offer. The rest of our two week vacation would be spent in the Tetons National Park. Hope you enjoyed these pictures and description of our time spent visiting Yellowstone National Park in Wyoming. It is unique, has much in the way of unusual beauty and is definitely worth a visit! Yellowstone has a beauty all its own. So happy to know that you enjoyed my photos and the videos. Great pictures and videos. The article gives a wonderful tour of this great natural wonder. Thank you for sharing your visit on this Hub. You write beautifully, but thanks for the compliment. I will eventually put many of my travel hubs on my own website which is in the development stage. Hope you do get to travel to Yellowstone someday and even get to spend more time there. 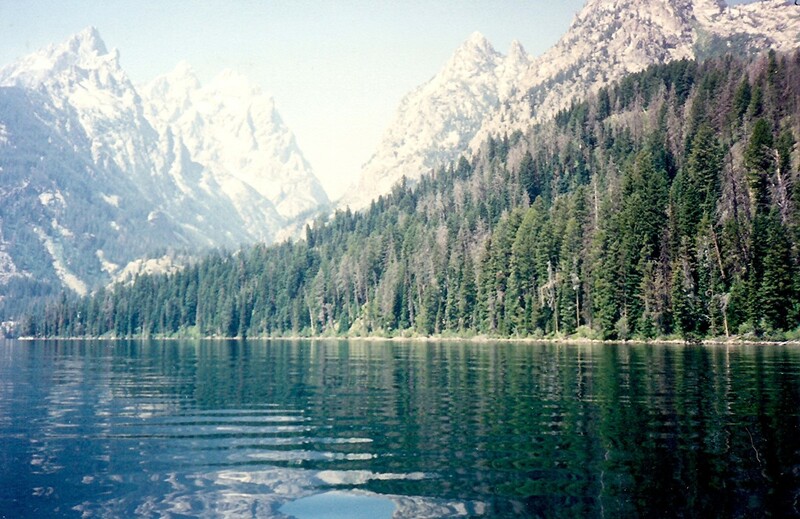 We spent most of our time in the Grand Tetons to the south of Yellowstone. Another wonderful national park filled with such beauty! After your lovely comment on my hub, I've been exploring your hub pages, Peggy. All beautifully written with lots of photos and videos, I can learn from your example. I've always wanted to visit Yellowstone National Park and this page has given me more impetus to go. Fantastic page. So glad that you enjoyed this hub. Thanks for your comment and vote. It does almost look like another planet especially portions of it. So glad that you enjoyed reading this and looking at the photos. Too bad you did not have the time to stop and see parts of Yellowstone. Maybe someday! Thanks for the shares. What an amazing trip that must have been! 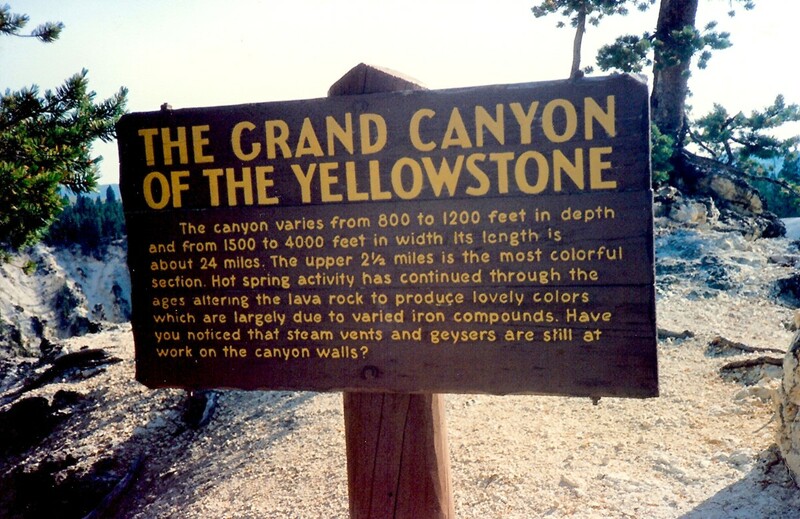 I enjoyed your photos to Yellow Stone and area. It looks almost like another planet from here. Thanks for sharing this! Great photos and videos and packed with tons of useful and interesting information as always! 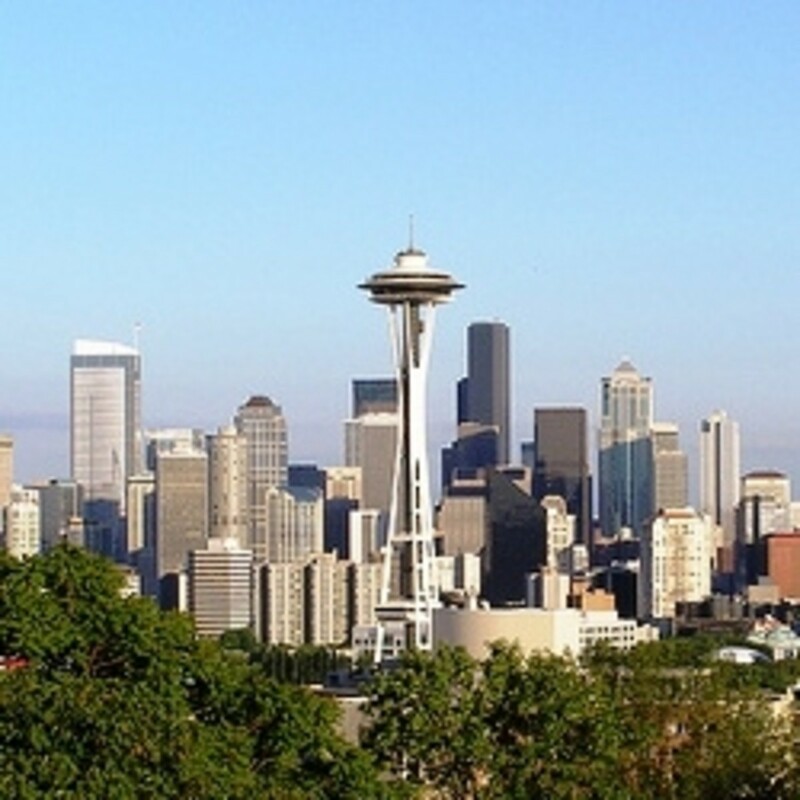 Voted up, BAUI, gave you 5 more stars, pinned to my 'Travel' board, and will share with my followers! 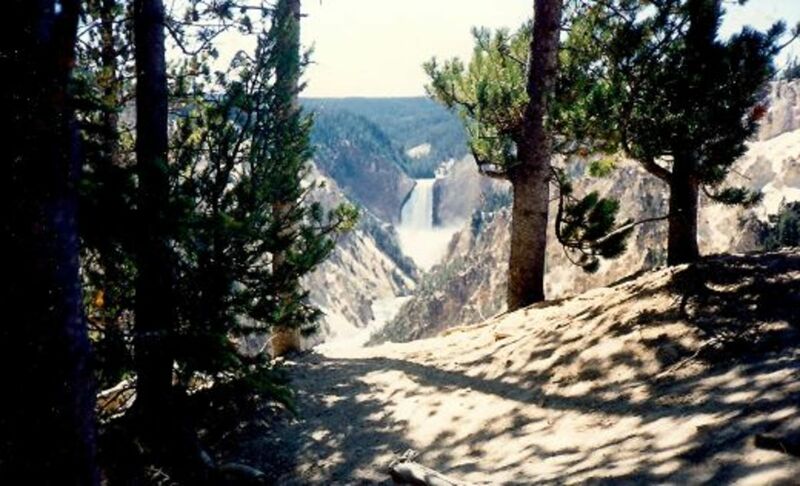 So nice to hear that you enjoyed these photos of Yellowstone and hearing about it. Hope that your dream of visiting this national park come true someday. Thanks for your comment and votes. Yes, Yellowstone National Park is huge! One could literally spend weeks to months there if one were to hike and explore more of the areas with over 2 million acres. The 2 long and full days we spent there were just seeing some of the highlights. It is certainly well worth visiting...as are all of our national parks. Thanks for your comment, votes and share. Peggy, these pictures are awesome. 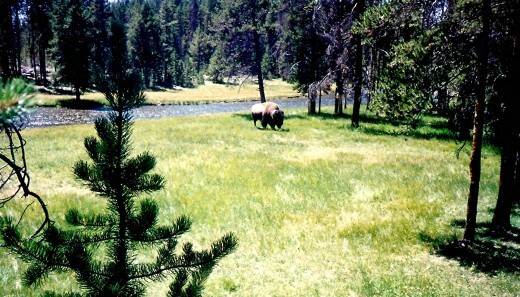 I wish I could see the Yellowstone Park someday... Thanks for sharing and making armchair travel possible.. Pushing all the buttons here. 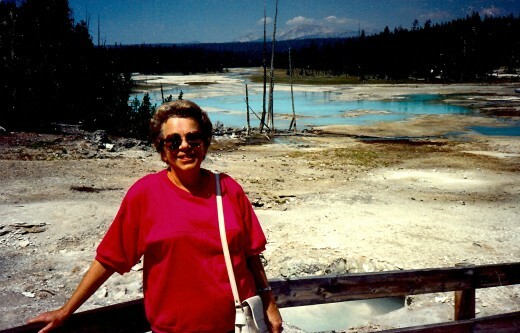 Oh, Peggy, I felt like I was right there with you, looking at the beautiful Yellowstone National Park. The videos you chose were wonderful. Your photos are great, too. I never realized the park encompassed so many miles. Yellowstone is on my "bucket list". I will read your other Hub on Yellowstone. It truly is a magnificent place in the U.S. I voted this everything except funny. I will certainly share with others. Yellowstone National Park is an amazing place. 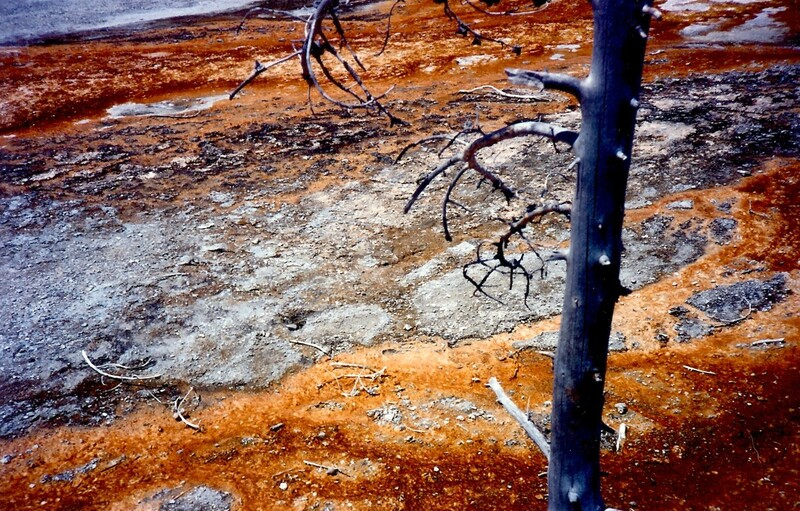 Be sure and check out my other Yellowstone hub regarding the colors made by bacteria and algae to see more. Talk about colors!!! When you go, be sure and have lots of batteries or battery chargers for your camera. Am certain that you will want to be taking your own photos of this amazing place. Thanks for your comment. There are many places in the world that I would love to visit, but I know that I will probably never be able to. 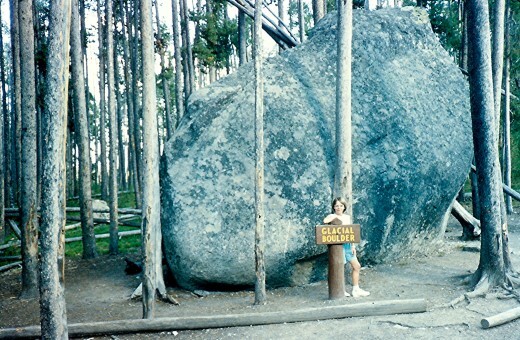 However, I might make it to Yellowstone National Park - it's high on my list! Thank you for the information and the very interesting photos, Peggy. There assuredly is much to do and see in the USA and many people could live here all of their lives and never see it all. That being said, there is much to also see in the rest of the world. 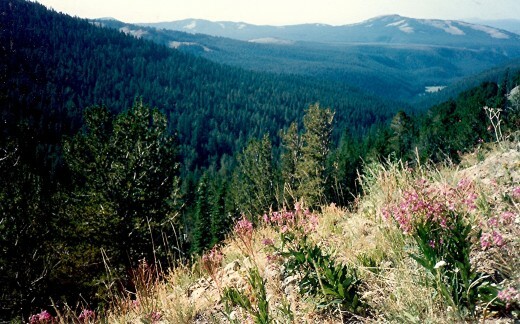 Thanks for leaving a comment on my Yellowstone National Park hub. 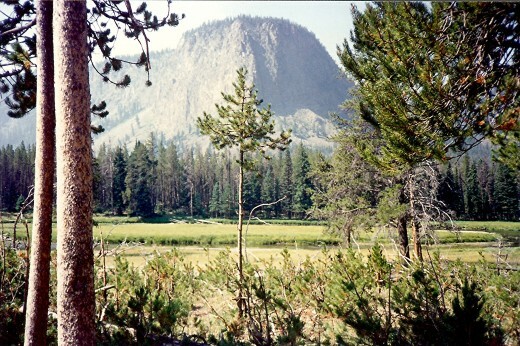 As to Yosemite, I saw that a number of years ago with a German girlfriend of mine and wrote about our adventures of seeing that and 9 other national parks plus some state parks along the way. It was a fabulous vacation trip! Did you write about your Yosemite trip? I have never been to Yellowstone but would love to some day. For many years I lived in the UK and now I am in Brazil and many people ask me why more Americans don't have passports. I think you have answered it here. There is such an array of stunning things to see and do, why go abroad. I love to see multiple generations enjoying the same thing. I took my kids and my mother to Yosemite and everyone loved it. They are memories I will always treasure. I love the photos you posted. Not just all scenery shots but also family ones. I really enjoyed reading it. Hope that you enjoy exploring Yellowstone National Park as much as we did. We only had two days and spent most of the rest of our vacation time in the Tetons that year (which I would also heartily recommend). Obviously one could spend much more time in Yellowstone and see even more. Enjoy your upcoming vacation! Wonderful article and photos! We are planning a family trip in August with our two girls, 14 and 11. Just starting to research and it looks like this has everything I will need. 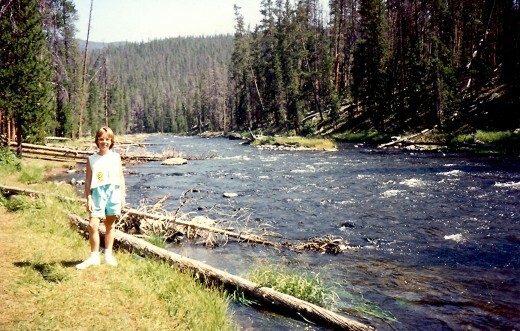 So very happy to know that you liked these pictures taken in Yellowstone National Park. Thanks for the comment. I agree with you that Yellowstone National Park is a national treasure. It is large and has so many distinct areas of beauty and interesting features that one could spend a long time exploring it. Thanks for reading and commenting. Yellowstone is truly a national treasure. You have captured it very well. I'm glad that it brought back good memories for you. It is doing the same for me as I write these travel hubs.